We are super-happy to announce that APE Games will be publishing Philip duBarry’s Rice Dice – A Spirits of the Rice Paddy Dice Game. Spirits is still a favorite game to play around the office, and we were giddy when Philip sent us the rules for Rice Dice last year. Rice Dice will be a streamlined Spirits game. Those who’ve played Spirits will fell right at home with the decisions that need to be made in Rice Dice. But don’t worry – even if you’ve never played Spirits of the Rice Paddy, you can get a feel for the game in a fraction of the time. A five-player game of Rice Dice can be completed in about 45 minutes! Faces contain one or two laborers, paddy cards, water, weeds and wild. Paddy cards are placed in front of players to represent the rice paddies they control. Players can have up to four paddy cards. Card: Active player can draw X paddy cards and add up to one of them to their field. Laborer(s): Laborers can plant flooded paddies, or weed and harvest unflooded paddies. 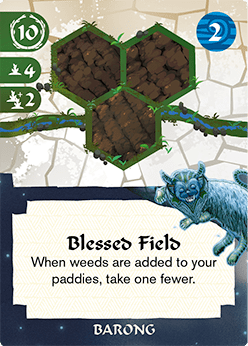 Weeds: Add weeds to each player’s field equal to the number of weeds rolled. Water: All player’s drain water from their paddies and the active player gains water from the reservoir equal to the number of water symbols rolled. Wild: Can be any face (except two laborers). The first player to gain 100 rice wins! Rice is normally gained by harvesting fields, but be careful – weeds reduce the rice yield! We will also take pre-orders for a reprint of the base Spirits of the Rice Paddy game. Watch for the Rice Dice Kickstarter in March! !